It was time for Play Day Sunday to make a comeback. Heather and Mr. K deserved a day of carefree play, lots of treats and most importantly, my undivided attention. They've handled my long absences from home as a result of the job I took last fall remarkably...mostly because Scottie Dad and our friend Shih Tzu Mom have teamed up to make sure my babies are taken care of every day. 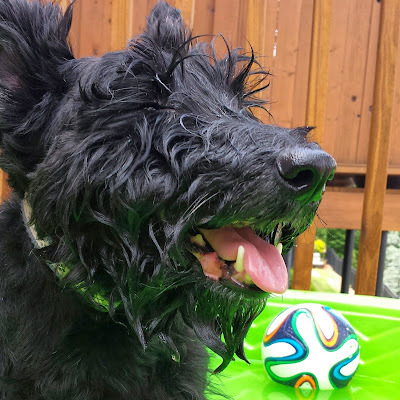 Still, as a devoted Scottie Mom, the guilt creeps up and I miss caring for and spending time with Heather and Mr. K myself. So, I set out to make another Play Day Sunday a reality for Heather and Mr. K.
We started off with a long, morning walk about the neighborhood. Round and round we went until Heather declared it was time for some breakfast. 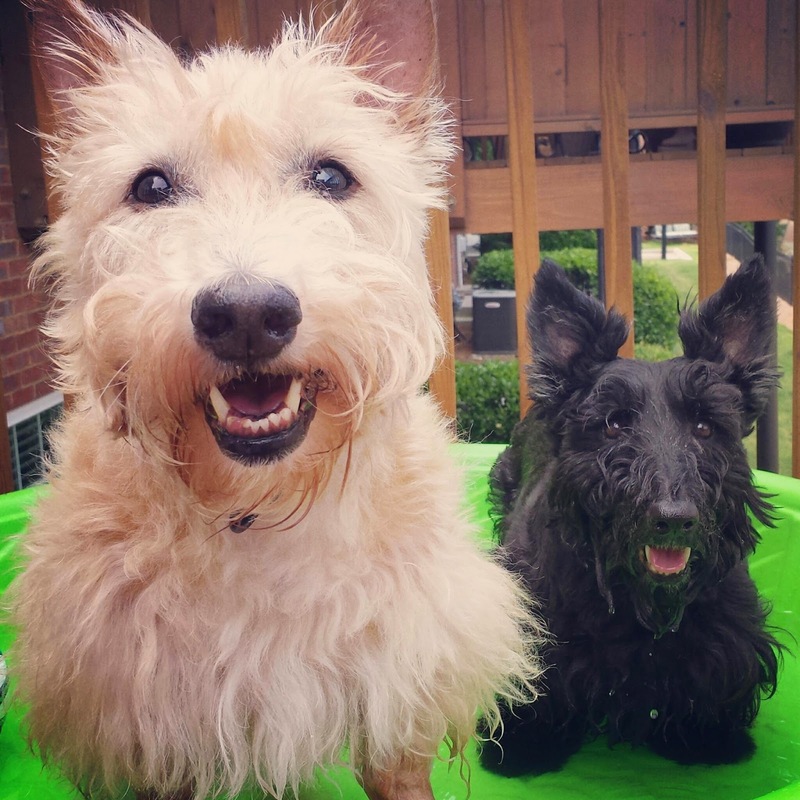 After the hungry, hungry Scotties had vacuumed up their yummy kibble, I opened the door to our back porch and let Heather and Mr. K soak up the sunshine as I prepared a special surprise for them. 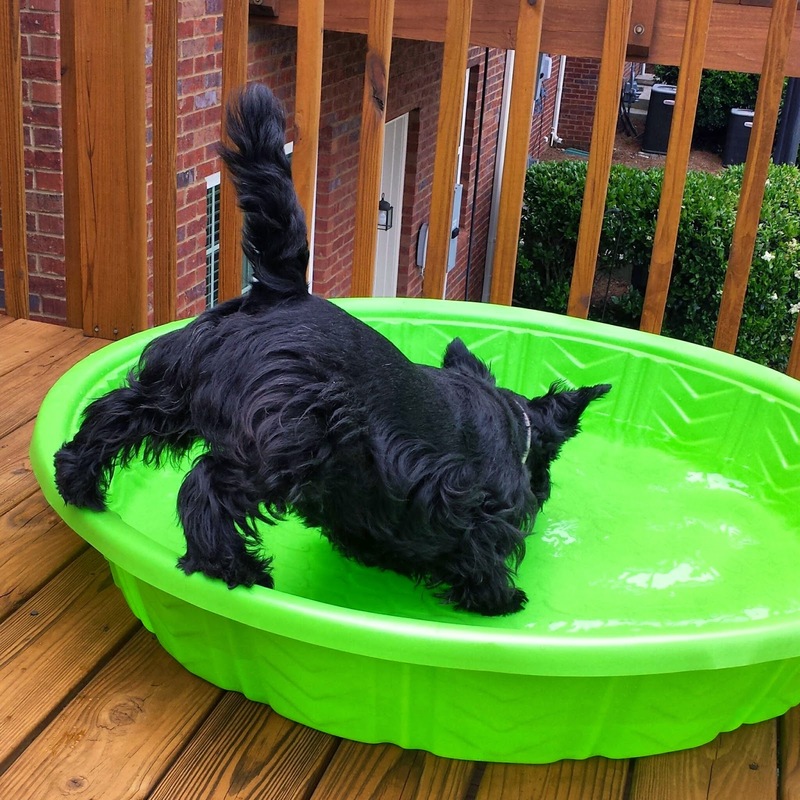 When the sun was just right, I brought out the Scottie-safe swimming pool I purchased last year at Target. Mr. K was so excited, he jumped in before we finished filling it! Heather, on the other hand, preferred to stay dry and could only be coaxed to dip her paws in the pool with the promise of tasty treats. The three of us stayed outside soaking up the sun, splashing in the pool (Mr. K even attempted water yoga! ), playing ball and indulging in sweet treats until that afternoon. Then, the skies opened up and rained on our Play Day Sunday parade. We were forced to retreat indoors for a bit until the weather cleared up and we were able to enjoy another walk around the block. Not long thereafter, dinner was served and the three of us settled in for the night: Heather snoozing on my feet and Mr. K snuggled up on my lap. This day of quality Scottie time was certainly long overdue and I think they enjoyed it just as much as I did. Let's just hope Heather and Mr. K don't think I only did this to earn brownie points after they discover they're headed to the V-E-T for a well-doggie checkup tomorrow! Oh NOOOO! Kyla would NOT have anything to do with water that was bigger than a puddle. H&K are brave. I like your style Mr. K! LOVE the last shot! 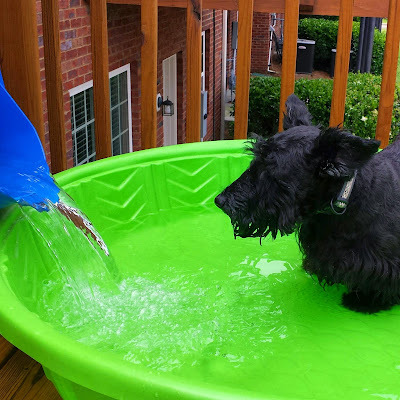 I love this green pool... can we fill it with dry water too? Oh Mr. K you are so funny jumping in with no water and staying in the pool while it was being filled. We do not like to get wet. We have a big pool 15 x 30 and have never gone in it. 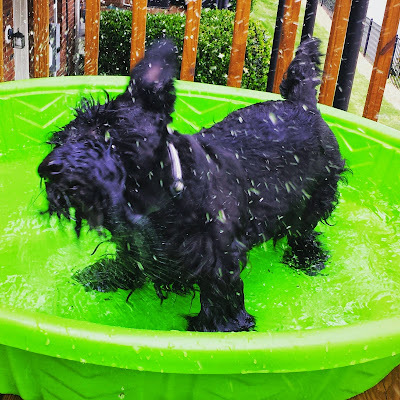 Mom said only one of her Scotties ever went in the pool and she had to jump in and get it out. Sure glad the pool was filled. What fun! What a fabulous day. You must have Scottie Days more often. So relaxing.